Greenpeace is a hard-core environmental group that first become known for trying to stop whaling activities by direct interference with the whalers. But that was decades ago. And now it has pulled a stunt against another culture that has destroyed its credibility forever. Officials from Peru’s Ministry of Culture, wearing special shoes, walk along the trail left by Greenpeace activists. CARACAS, Venezuela — President Ollanta Humala of Peru criticized the environmental group Greenpeace on Saturday for not respecting his country’s archaeological heritage as authorities said they intended to seek criminal charges against several activists who damaged the fragile desert around the Nazca Lines. Greenpeace stirred up a storm of controversy in Peru last week after a group of about 12 activists on Monday entered a protected area around the famous lines to place a sign promoting renewable energy on the ground. The sign was meant to attract the attention of world leaders who were in Lima for a United Nations summit meeting on climate change. 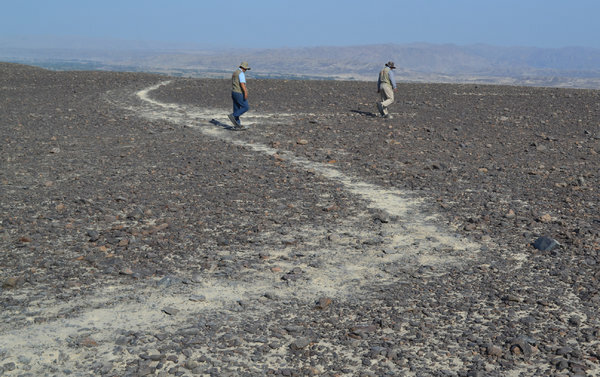 Officials said that the activists walking over the fragile desert ground left marks that cannot be removed. The Nazca Lines were created over 1,000 years ago, and include enormous figures of birds, mammals and geometric shapes etched into the earth. He said that he hoped that prosecutors and the courts would take action against the activists. In a strange twist, a judge on Saturday rejected a request by prosecutors to detain the activists or keep them from leaving the country, saying that prosecutors had failed to provide their addresses. But the request by prosecutors appeared to be too late anyway, since Greenpeace had said a day earlier that the activists had already left Peru. Luis Jaime Castillo, the vice minister for cultural heritage, said in a telephone interview that the authorities still intended to pursue criminal charges against the activists. He said that he had met with several Greenpeace members in Lima on Thursday. 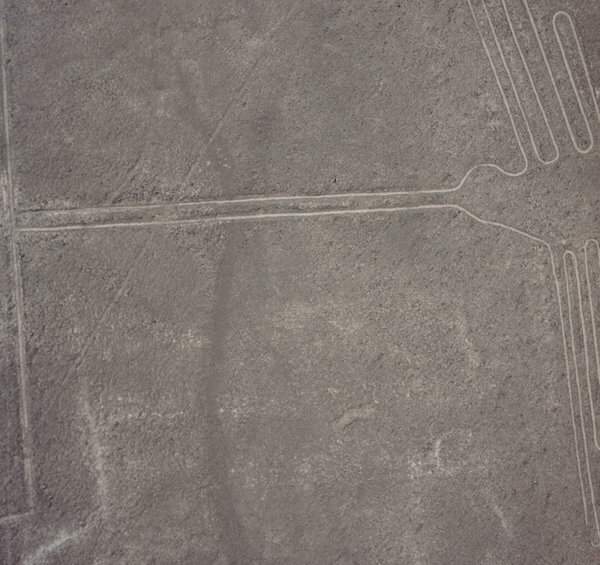 The group included one of the activists who took part in the incident at the Nazca Lines. He identified the activist as Mauro Fernández, who appeared in a video taken during the stunt and posted later online. Mr. Castillo said that he asked for the names of the other activists who participated in the stunt, and that Mr. Fernández told him that he could not remember their names. That appeared to fly in the face of pledges by Greenpeace to cooperate with the authorities. Mr. Castillo said officials suspected that some members of the group had visited the site on a previous occasion to prepare for the stunt. Greenpeace has issued a statement apologizing for the incident. A Greenpeace spokesman could not be reached for comment on Saturday. The ground around the lines consists of white sand topped by a layer of darker rocks. When the activists entered the area they disturbed the top layer, exposing the sand below. As word spread about what Greenpeace activists had done, hundreds of angry people went to the organization’s Facebook page to express their outrage at its sheer hypocrisy. Assuming that the site suffered damage that cannot be repaired, then Greenpeace itself should also be damaged beyond repair. Shut it down! 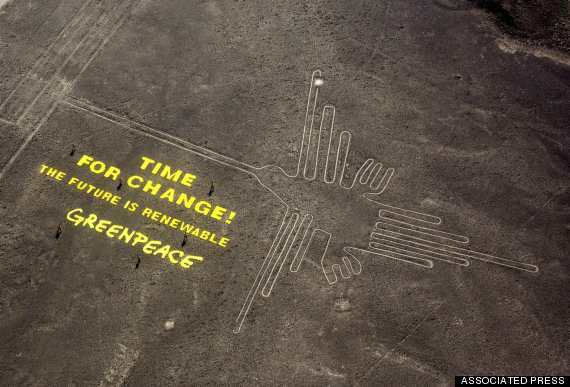 This entry was posted in hypocrisy and tagged Greenpeace, Nazca Lines, Peru. Bookmark the permalink. ← Pie charts and privilege. Last month, the environmental group Greenpeace, whom I am ashamed to admit I formerly supported, committed a horrifying act of cultural terrorism by permanently damaging the Nazca lines, a World Heritage site in Peru, with what amounted to a cheap publicity stunt. This article by Dale Husband, run two weeks ago, sums up my own thoughts on why Greenpeace has forever destroyed their credibility and reputation, and why in my opinion even someone like me, very concerned about environmental issues and causes, will never give them a dime of support ever again. There are far better environmental organizations out there who are much more deserving of your support, and who understand, evidently unlike Greenpeace, that part of environmental justice is guarding the human (as well as the natural) legacy that is the common cultural background of the Earth’s peoples. I feel like the organization still has value, just some individuals within in it have lost site of the real objectives. Don’t lose complete faith. I have lost no faith at all in the environmental causes of Greenpeace. We can always start a new group to carry on the fight without the stigma of the one that caused that outrage in Peru. I agree with you, you get people doing idiotic and self defeating acts everywhere, it just sadly humans make mistakes and i agree this was a bad one for Greenpeace to make, but i still support my local Greenpeace group. Absolutely. They still need support!